Looking for extra copies? 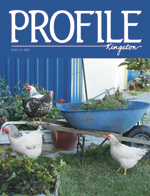 Pick up Profile Kingston at the participating advertisers listed below, while supplies last. For more information about our advertisers, contact them directly, or click on their website/link, where available. Click here to view the Table of Contents or excerpts from our Current Issue.